It’s become increasingly difficult to know what you’re buying when shopping for makeup education. It seems like everyone is offering a seminar, workshop, or “masterclass”. Problem is, many of these people have no business teaching, much less charging you $$$ for it. How can you tell the difference between credible educators and people who are only in it for a cash grab? Research is critical when you consider investing your hard earned money on makeup education. What are the educator’s credentials? What qualifies them to charge you ($$$) for their guidance? What have other PAYING students said about the educator’s ability to teach? …must have the ability to provide you with training that will elevate your skill level and increase your earning potential. Location of a class does not validate the credibility of an educator. Just because an educator presents at a beauty school, it does not validate their teaching ability. Many educators (myself included) rent the space OR agree to promote their school during our class as compensation for use of the location. Sponsorship is a business transaction, not an endorsement. Sponsorship is a way to help fund a class to offset running costs or supply it with free products/services. The sponsor(s) is compensated with prominent visibility and mentions in the marketing and PR of the class. Don’t confuse experience with popularity. Social Media provides artists with a powerful marketing tool to build recognition and their brand. But popularity and experience are two VERY different things. Some artists with large followings on YouTube and Instagram try to cash in ($$$) on their popularity before they’ve had enough actual work experience to justify charging for education. Unless you have a minimum of five years working experience as a full-time **professional makeup artist, you DO NOT have sufficient experience to teach others. **a professional makeup artist is paid to apply makeup to others, as one of their primary sources of income. Being a great artist does not automatically make you a great teacher. Teaching requires specific skills. Those skills are independent of artistic ability. The harsh reality is, an extraordinary artist, with excellent credentials, might not be able to effectively explain their process or teach you how to replicate their techniques. Only invest in beauty education if the artist presenting is recognized as a proficient educator by other skilled educators. 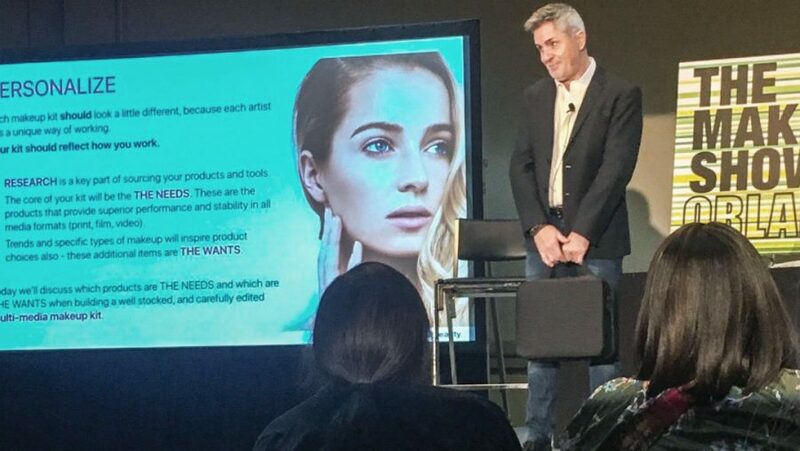 Sidenote: I did not consider teaching until I had over a decade of working experience, and my teaching ability was reviewed and approved by makeup education experts. Does the educator have the credentials to teach this? I’ve watched many people present education in areas where they have minimal or no experience. They MUST provide credentials to substantiate taking your money for education. How can you tell if they have the experience/credentials to teach this curriculum? ASK. 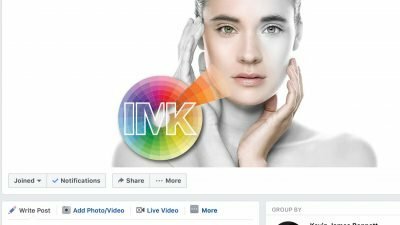 EXAMPLE 1: Does the educator teaching Makeup for Print & Runway supply credentials from runway shows they have keyed (designed) or published work in reputable magazines (print or web)? EXAMPLE 2: Does the educator teaching Bridal Beauty/Business supply credentials verifying their success working in the bridal beauty industry? EXAMPLE 3: Does the educator teaching HD Makeup supply credentials working in the television/video industry? In what capacity and for how long? 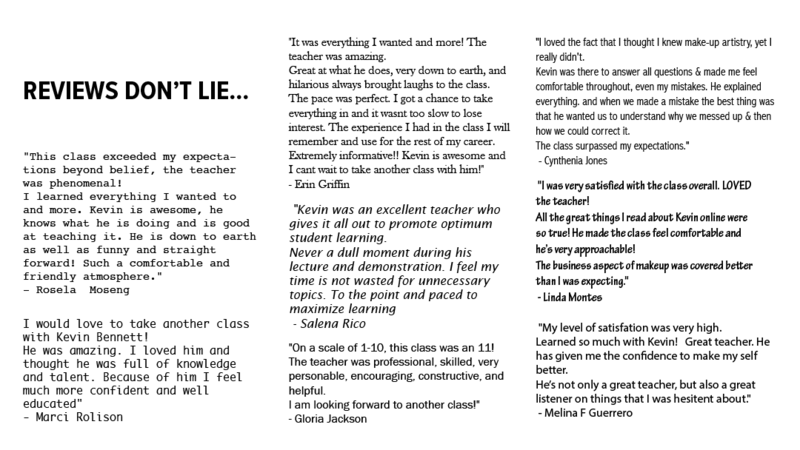 What’s the feedback from former students? Do former students feel they learned enough to justify the cost of the education? Were they satisfied enough to recommend this educator? Does the educator’s website publish these student reviews? I am a HUGE advocate of continuing education and truly believe we never stop learning. This includes educators. I constantly update my knowledge base and skill-set, so I can offer students the most relevant information and techniques. Proper research and asking lots of questions before purchasing makeup education will prevent you from wasting time and money on unqualified educators. This is a great check list. I see people straight out of cosmo school trying to teach. Experience and expertise come with time. Period. Thank you Kevin.